In contemporary film theory, body and mind have been central to explorations of film form, representation, and spectatorship. While the soul may seem to have no place here, the history of film theory and its legacy to the present suggest otherwise. From the origins of film theory – from Hugo Münsterberg through French Impressionism to writings of the Weimar Republic – to the mid-twentieth century work of Henri Agel and Amédée Ayfre, as well as Edgar Morin, the soul emerges as a multi-faceted, if contested, concept. 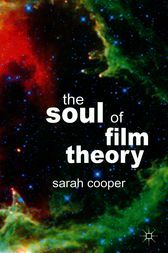 By revisiting such key moments in the history of film theory, and tracing the survival of this concept through to a range of cutting-edge debates today, from the work of Vivian Sobchack to Jean-Luc Nancy, Gilles Deleuze to Torben Grodal, The Soul of Film Theory tells the heretofore tacit tale of the relation between cinema and the soul, from classical to contemporary times, in dialogue with philosophy, religion, and science. Sarah Cooper is Head of Film Studies and Reader in Film Theory and Aesthetics at King's College London, UK. She is author of Relating to Queer Theory (Peter Lang, 2001), Selfless Cinema? Ethics and French Documentary (Legenda, 2006, 2008) and Chris Marker (MUP, 2008).